Meet Cecil. He is my new pet spider. The best thing about Cecil is that he does not poop or pee or chew up my favorite flippers. He is a dapper fellow donning a festive striped bowtie and handsome mustache. Cecil has belongs to a whole family of pipe cleaner spiders. There’s his lovely Mrs. who is sporting an elegant designer scarf. Last, but never least, is their li’l sweetheart Daisy who wears a pretty li’l bow in her “hair.” We had so much fun making these furry little critters, that we made another set for my sister and her family. This batch was more sophisticated with each little spider holding a teeny flag in hand like an accomplished mountain climber. Christmas seems to arrive earlier every year. The shops have already started offering ornaments,trees and other Yuletide things. By mid-November last year, we needed some extra lights for our tree and I could not find a single store that still carried them. Shocking. Let’s not forget Halloween comes before then. Cozy weather makes unexpected quick appearances here, but does not stay long enough for us to get the neck scarves out. The short rainfalls are a welcome change, but the thermostat hasn’t dropped enough for us to light the fire. So, we pretend with festive lights in our fireplace. My little mermaid and I have been working on sprucing the house with autumn colors. We are not fans of the blood-stained machete, skeletons with glowing eyes and other such freaky Halloween stuff, but we do like a few spooky things. While the best cobwebs are made by real spiders (and we have plenty of those around the house), we set up some of the store bought stuff and made a cute little family of arachnoids to make a gnarly statement. This is such a fun and inexpensive craft with very little, if any mess. These little cuties are a big hit with the kids and add a touch of whimsy anywhere they sit….or hang! Making the spiders was a bit of a last-minute thing. I had a ton of black pipe cleaners left over from a previous craft and got this idea in my head. The spiders are super cute with nothing but the pipers and googly eyes, but I had one black pompom that I used as the head for the Daisy spider. It turned out extra cute. If you can’t find pompoms, don’t worry about it. These little guys turn out adorable without them. Grab the kids and start making your own now. Here’s how. Caution: If using a hot glue gun, protect little hands from getting burned. Bend 4 pipe cleaners in half and cut. For a smaller spider, cut the halves into half again. finger to form a spiral. Insert the four pipe cleaners through the center of the spiral. Shape the legs so that there are 4 on each side. Bend the “feet” into shape. If you have the pompom, glue it into place for the head. Attach the eyes with glue. Tie ribbon into small bow and glue into place. That’s it. You’re done. Now make some more! « Easy Caramel Sauce + TWO Giveaway Winners Announced! I'm dying! I used to love to get a fresh package of pipe cleaners and make little men and characters out of them. This is totally nostalgic for me – and perfect for the season! Yes, the googily eyes are the finishing touch that makes these leettle critters so cute! 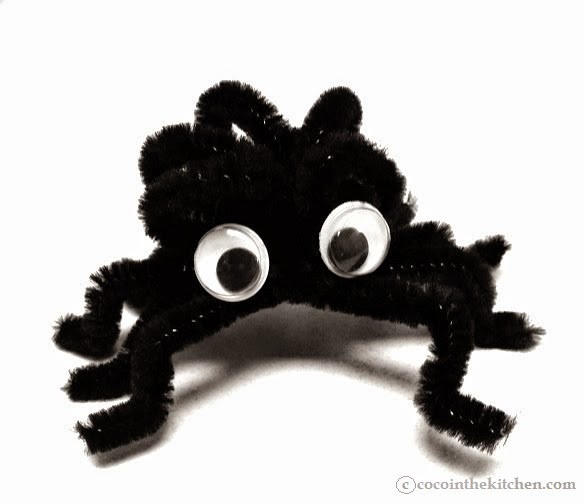 Dear Colette, crafts are wonderful, especially at this time of year with Halloween just around the corner – I am loving your black spider made out of pipe cleaners – the kids would absolutely adore making these! Such a fabulous craft to make with the kids! Thanks for sharing, daer friend! Coco! These are so cute! I may be adding them to my daughters lunch box this week!! I love your daughter's mermaid costume. So cute. Dear Colette, I hope all is well with you and your lovely family! I wanted to take this opportunity to wish you all a very Happy and Healthy Thanksgiving!